This weekend we were at my in-laws' place for a very quick visit. We went largely for a housewarming for Cheryl and Ethon, which was Sunday afternoon. They have a pretty darn cool place, so yay for you guys! Sunday morning pictures are normal, we do them alot. This week, before we left for church, Carole took a few pics of my little poonchin. They didn't all turn out great, as she kept making funny faces and moving at the last second. I stole them off her camera for my collection, and when I looked at this one I just kind of stopped. It's not any super great picture. It's cute, but hey, how could it not be? She's waving at herself, that's the reason the hand is up. But that's not what I saw. Go ahead, click on the picture. Can you see it? 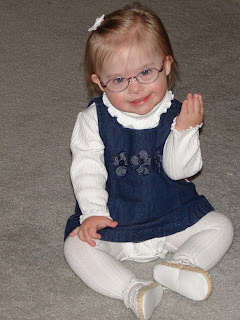 I don't see Down syndrome. I don't see a feeding tube. I don't even see a tough cookie, open-heart surgery survivor. It's not my favorite picture of her ever, but I can't hardly stop looking at it. This picture, to me, is a picture of what's to come. She looks less baby-like here. She has a whole different look to her, which I think will be amazing to compare to a 2nd grade picture or something in a few years. I can't explain it, I just see our future there. I don't think she really resembles either of us, now or in this pic, but I do see more of herself coming out in her face here. There's something grown-up about that little smile. I just can't wait to see how she grows into her personality. She's going to be one great little girl. She is quite a gal. :) And yes, they do grow up in a hurry. Enjoy each day because they get away in a hurry. I received the Baby Legs in the mail today. My newborn is wearing his right now. We love them! Thank you so much! I think I also see the I Love You sign? You know what? I am a very newcomer to your blog and I saw the maturity on her face...she looks very bright and knowing...all rolled up with sweetness. I love when we catch these things in our kids! what a nice picture for you to have - a little glimpse into her future and yours - she does look more like a toddler than a baby now, she's getting that little girl look, don't blink too often cause before you know it she will grow up on you. She is very cute. And yeah, growing right up. I have those moments too, where I suddenly see from a different angle. Strange, but good. I'm looking forward to seeing her 2nd grade photo! oh I love this picture! It's so sweet - and she looks so grown up - and as always, beautiful! She is awesome, Randa-Kay. I love watching her grow up. She is beautiful inside and out and she has come a long way. The minute I saw her picture I thought how grown up she looked. She is such an amazing little girl RK, absolutely beautiful! That's exactly what I thought when I saw the picture. She's getting so big and losing that "baby" look. She is so beautiful. Your tomorrows are going to be so wonderful. great post. and great photo. before i even read your post, my first thought was "she's all grown up"! She is beautiful-You have so much to look forward to! I love the picture myself. In fact it serves as the desktop picture on my computer right now. RK, I see it too!! She looks so grown-up here, but in a good, reassuring way :) I think it's one of the best pics you've got of her... although she's adorable in all of them of course! Enjoy cuddling her. Carolyn--Thanks. And they already seem to be speeding up. Mia--Thanks. I'm glad you got the BL's. Yay for newborns in BabyLegs! Would love to see a pic!! Lindse94-I didn't notice the other hand, but you might be onto something! Sherri--I was sitting there as the pic was being taken and I never saw this look...fun surprise. Jessie--I don't know if I'm ready for toddler! Cate--This talk of 2nd grade has started to make me feel old! Andrea--Thanks...beautiful inside and out. That's my goal for her. Mom--I've looked at my old pics and I don't see any resemblance at all. Melissa--I agree...she continues to amaze me. Jen-- It DOES kind of just pop out of the pic, doesn't it? Thanks. Carole--You took a good shot. Wise desktop choice! Mrs. Wibbs--She's a good cuddler, so I'm lucky! Mindy--Funny how it kind of disappears. I never thought I would be able to say that. Your post really comes at the same time I have been feeling those same thoughts about Tommy. Braska is such a beautiful little girl! I think for me just having the first year over and done with, the ng tube gone, the heart surgery scar healed.... I see Tommy now. I don't see Ds, I don't see special health needs, I see one lil' guy whose arms are reaching for me, whose eyes follow me thru the room, whose voice cries for me when I'm far. Truely our children have changed over this year. Or have we changed? God has such wonderful things ahead for our kids and for us! Praise God! Much love to your family from the great northwest! I've noticed in the last several pictures you've posted that she is looking more and more like a toddler. And what I see in this picture is an adorable little girl. She IS beautiful! She is just SOOOO cute RK! She is a beautiful little girl! When I looked at this picture (before I even read the words) I TOO was stopped by it. I was thinking, "My goodness, she is so cute, and she looks so grown up!" So I DO know what you mean. She is great! Even though you have a ton replies, I have to add mine! I saw this pic and thought, "WOW~ I can't believe how grown up she looks!" She is an absolutely gorgeous LITTLE girl in this photo. She is adorable and oh so cute! I just love this pic! Sandi--Sorry for those disappointing days of no posts. It's kind of nice to know someone's looking forward to it. Our kids have come A LONG WAY!! Hugs to that Tommy boy! Tricia--Our girls are gonna rule the world!!! SunflowerMom--Thanks! It's exciting to see her getting so grown up!